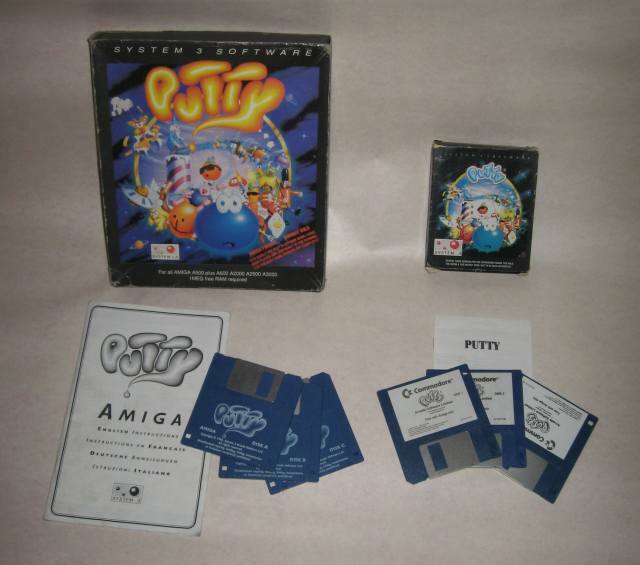 -= PUTTYMOON =- Welcome to Amiga Putty tribute! Originally, there was a game called Silly Putty. It was packed in a small box, with the blue sign Silly Putty over the front box cover artwork. This package was bundled with the Commodore Amiga 600 pack called "The wild, the weird and the wicked". The game manual has only 6 pages of text, but accidentally one of the pages it there twice. Very soon, while the bundle was already in shelves, the problem with the name copyright occured and the game had to be renamed. So only the early A600 bundles contained Silly Putty. 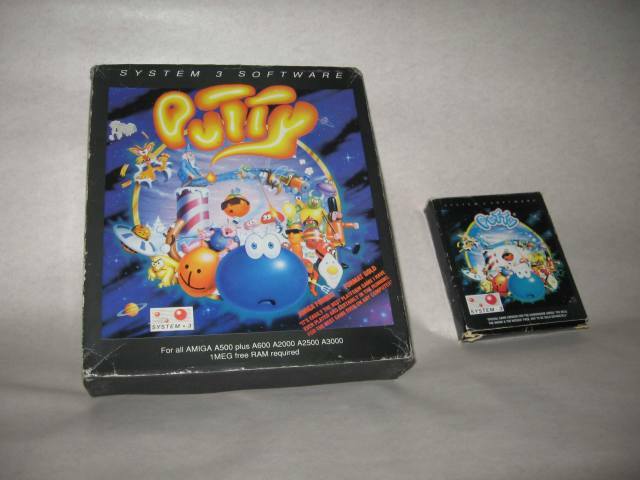 The later ones were packed together with the newer version, this time called Putty. 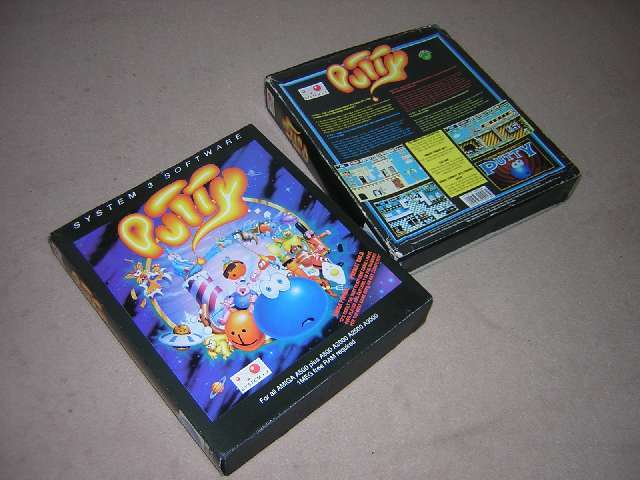 This first Putty (or the second release) had the similar tiny box, with adjusted front cover illustration (it differs in the nebula in background). Because it was made in hurry, the System 3 staff only cut the original sign 'Silly Putty' in half, rotated it and placed to the original illustration. Because they modified the nebula in the background as well, this release is the only in the whole serie, that misses the illustrator's signature in the lower right corner. Of course, they had to change the name on the game floppies stickers as well as in the manual. The admirable is that although everything was made in big time press, the System 3 managed to enhance the game itself seriously, so Silly Putty really evolved into a Putty. All later versions were now based on Putty. The third, most common release, is the big box. This one reached the market after the Amiga 600 bundle was out of sale and was intended for shops. System 3 had enough time to polish it, so it contains the brand new manual, which differs a lot from the tiny box releases. The cover is based on the first release, has the original background nebula and also the signature, but the new orange word Putty, which replaced the old blue one. The game remained the same. Fourth release was budget, put on market 2 years after the first one. This time it was produced by Gremlin in its budget range GBH. 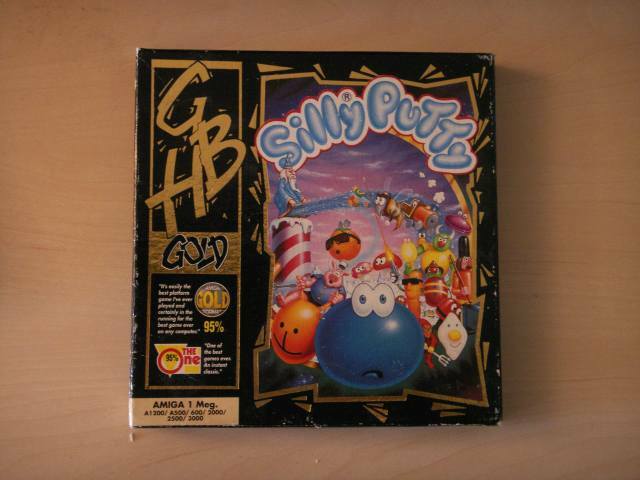 To support a confusion, Gremlin didn't care about name copyrights, used the first original box graphics and released Putty under the name 'Silly Putty'. But only the name belongs to the first game, everything other is the standart Putty - the game and the graphical manual from the big box release as well. Gremlin altered the cover of the manual though and gave it the same look as he has 'developed' for his box. 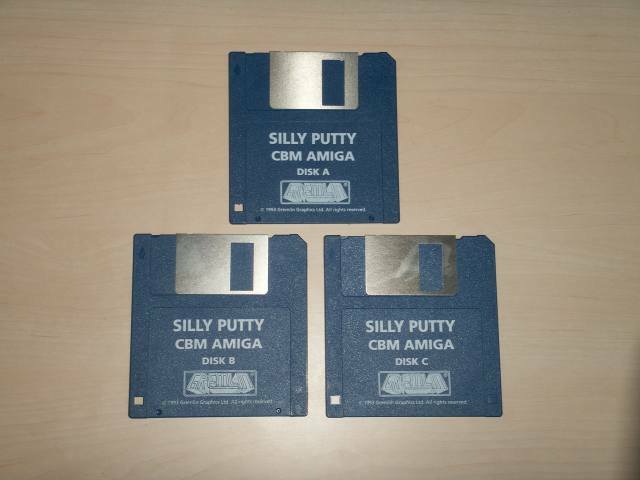 Finally, in the same year, System 3 deicided to release Putty for Amiga CD32 console as well, under the name 'Super Putty' (the word 'super' comes from Super NES, as usuall on most multi-platform games). The game kept the same as the Putty, they only adjusted the controls a little for the CD32 gamepad. The package has changed completely, though. Game came on CD, in standart jewel case, without a paper box. The booklet illustration was new and had nothing to do with previous ones. It also contains a new System 3 logo and the incorrect screenshot on the rear side, which comes from SNES version. The big and the small package of Putty. The small one is earlier and was released together with the Commodore Amiga 600 pack "The Wild, the Weird and the Wicked". Contents of both packages. The little one's manual doesn't contain pictures. The front and the back side of the big package. 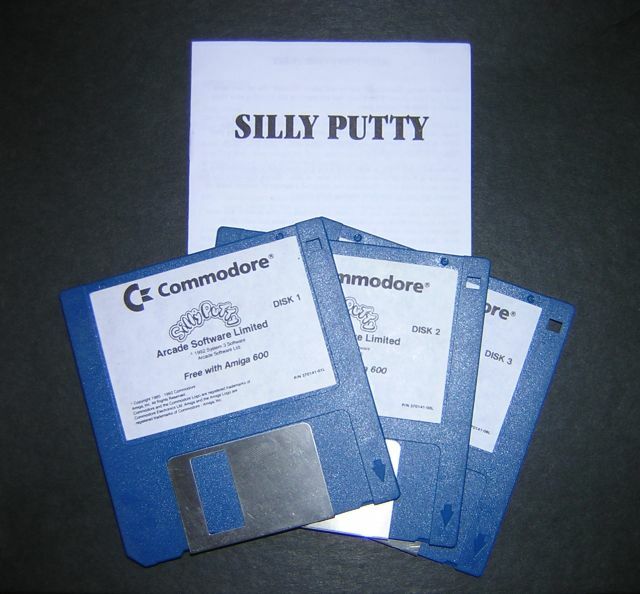 Floppies and manual of Silly Putty's original release. GBH Silly Putty budget front cover. GBH Silly Putty budget rear cover. Floppies of GBH Silly Putty budget. 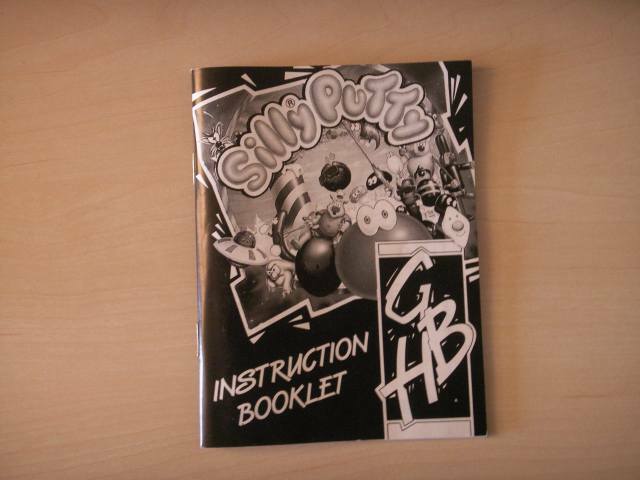 GBH Silly Putty budget manual. 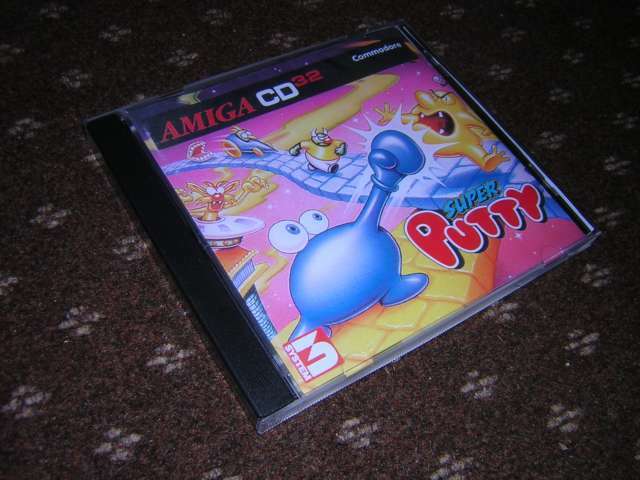 Super Putty for CD32, front cover. 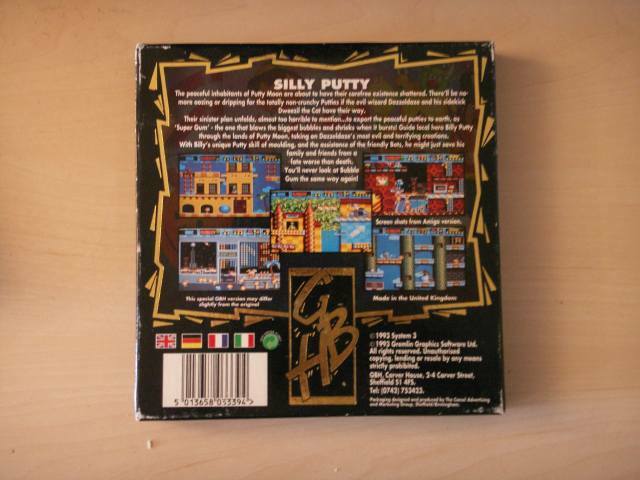 Super Putty for CD32, rear cover.